June 3, 4, 6, 7, 8, 9, 10 & 11, 1983. “Tom Jones ‘Live’ At The Barn”. In January 1982 Christopher Kenneford of the Southwick Players suggested joint production with The Wick Theatre Company. The proposal was well received and representatives of both companies met to develop the idea. From Christopher’s original proposition Tom Jones was born. The gratifying aspect has been the harmonious alliance of two Drama Societies who have over the years developed independent identities and a healthy degree of ‘rivalry’. The play is faithful to Fielding’s novel for the most part, although, as one would expect, several less important characters not essential to the main story line are omitted. The plot charts the progress of the high spirited foundling Tom Jones, through mid-eighteenth century England. It is a journey ‘fraught’ with such divisions as willing country wenches, illicit liaisons in country inns and brushes with vice and corruption in London high society. Here the deserted wives of officers fighting the Pretender north of the border offer all sorts of temptations and dangers to our young hero! Joan McAlpine’s character-drawing is true to Fielding except in the case of Mrs. Fitzpatrick. In order to keep the play to a manageable length, she is allowed to assume the character of Lady Bellastron in the latter part of the plot. In the book Lady Bellastron is a major figure but is here dispensed with entirely except for one brief reference in the second act. The Players: The Southwick Players was formed in 1935 and among the founder members were George and Stanley Baker and George’s wife to be, Venetia Brice-White, all of whom are still very active in local theatre. There was no theatre in Southwick in the pre-war days and the Players performed at various venues including Brighton. After the war Players members were prominent in the early work to set up a Community Centre at the Southwick Farm buildings. They had always been anxious to find a barn to adapt as a theatre and the Barn Hall, or Theatre as we now know it, benefited from their support and hard physical work. The Theatre was opened in 1951 and the Players have presented plays here ever since. In the early days the Players already had a very strong membership and even before the completion of the Barn Hall reached the national finals of the British Drama League competition with Elizabeth & Darcy by Constance Cox. This celebrated playwright has kept in touch with the society over the years and has produced for them on several occasions. In 1956 the Players became closely associated with another successful playwright, the late Phillip King, when they presented his play On Monday Next. As a local resident he formed an affection for the society and later became its president. The Players have presented many fine plays over a period of 47 years including Our Town, See How They Run, This Happy Breed and Separate Tables, to name a few. The Players’ president is Muriel Press. Wick: In 1948 Elizabeth ‘Molly’ Penney formed a youth drama group which took the name Unity Players. Then, in 1951, on the opening of the Barn Theatre at Southwick, they presented a One Act Play and changed their name to The Young Wick Players. During the 1950’s the acting membership was all under thirty years of age but in 1962, as the membership had grown and covered a wider age range, it was decided to change the name to The Wick Theatre Company. Molly Penney continued to provide guidance and support for the Wick during its first 22 years. Since her death in 1970 the company has benefited from the continuing support of her husband George who has, in many ways, encouraged the development of theatre in Southwick. David Stenning – Tom Jones – David joined the Players as a young lad in the mid-seventies and was first seen in the production of Little Red Riding Hood. He so impressed the Players’ President at the time, the late Phillip King, that he was given the leading rôle in Phillip’s production of his own comedy Here We Come Gathering. David has since gone on to appear in many more shows with the Players – most recently as Water Rat in Toad of Toad Hall. Incidentally, David was on the shortlist of two to play the title rôle in the TV series Just William a couple of years or so ago! He studies Drama in Brighton, is a keen amateur footballer and works for a local motor distributor. Alan Upton – Squire Allworthy – Alan has been a member of Wick for over ten years. He is probably one of the best comedy actors to have appeared on the Barn stage, witness his Odd Couple and How the Other Half Loves. Alan is a perfectionist and gives infinite care to all parts great or small. Some of you may remember his Sir Charles Marlowe in She Stoops to Conquer. Ralph Dawes – Thwackum – A founder member of Wick, Ralph is a very experienced actor and a master of many parts – ‘Enry Hornett in Sailor Beware!, Cromwell in A Man for All Seasons, William in You Never Can Tell and recently Edward Strachan in Pink String & Sealing Wax. Ralph is a director of a local roofing firm. Ken Mandel – Squire Western – Most recently seen as Mr. Badger in Toad of Toad Hall, Ken is one of the Players newer members. He has, nevertheless, appeared on the Barn Stage on several occasions, notably in Ten Times Table and Time To Kill. Ken owns a DIY shop in Hove. Lucy Mandel – Sophia Western – Ken’s wife becomes his daughter in Tom Jones! Lucy has been with the Players for a number of years and her credits include A Shot in the Dark, The Seashell, the title rôle in Cinderella and recently Children in Uniform. Sally Bacon – Honour – Sally has been a member of Wick for 15 years and had her first part in Miller’s The Crucible. Since then she has played many excellent character parts, her latest being the ‘odd’ maid in Goodnight Mrs. Puffin. But Sally has a lovely voice and probably likes to be remembered as the Nurse in Oh What A Lovely War! and for her part in The Boy Friend. Mo Joyce – Susan – Mo has been a member of Wick for two years and first appeared in The Mad Woman of Chaillot. Mo is a Management Training Consultant and recently joined the ranks of the local theatrical family Joyce when she married Peter, Wick’s Secretary. Vikki Wood – Jenny Jones/Waters – Vikki joined the Players in 1975 and has taken leading rôles with the company – ranging from Principal Boy in Pantomime to more serious drama. She was recently voted Best Actress in the 1983 One Act Drama Festival for her performance in Muck from Three Angles. Miranda Bowen – Mrs. Fitzpatrick – Like Alan Upton, Miranda is a master of comedy. She is an ex-Bluebell dancer who now dances and choreographs for Wick. Her best remembered comedy roles have been in Secretary Bird, How the Other Half Loves, and Plaza Suite. Nor can we forget her Maisy in The Boy Friend. Neil Shephard – Capt. Fitzpatrick – Neil was a memorable Iago in Othello – a really towering performance. He has come a long way since his first appearance for Wick in Boeing Boeing in 1969. His range has expanded over the years in many Wick plays – recently, Absent Friends, Maxim in Rebecca, A Man About the House, [a play he appeared in for Brighton Little Theatre at very short notice, after Wicks’ production] and Bill Sykes in Oliver. Neil was awarded Best Actor in the 1983 One Act Drama Festival for his part in Research. Neil is a school teacher in Brighton. Gerald Wicks – Lord Fellamar – Well known to Barn Theatre audiences, Gerry has appeared on many occasions to great acclaim. His credits include Move Over Mrs. Markham, Come Blow Your Horn, Quality Street, Don’t Just Lie There Say Something and The Lion in Winter. Frank Seamus – Constable – A recent recruit to Wick, Frank has many years experience – especially with the London based Unity Theatre. He recently played Stephen Parker in Goodnight Mrs. Puffin. He is a keen harmonica player and performs with a Lancing based orchestra. Sheila Wright – Woman with a basket – Sheila has been a member of the Southwick Operatic Society since its foundation in the early 1960’s and among many parts has played Iolanthe. Her most recent appearance for Wick was as one of the ‘old ladies’ in Arsenic and Old Lace. She is also a member of a Shoreham Church choir. Hilary Wiltshire – Molly – Makes a welcome return to the Southwick Stage after three infant productions of her own. She has made many memorable appearances with Wick, including Lion in Winter, Othello, Oh, What a Lovely War, Lady Windermere’s Fan and Trelawny of the ‘Wells’. Tom Jones is no stranger to Hilary, as she also played Sophia in the Lewes Little Theatre production. TWO rival Southwick companies have pooled their resources for what should be one of the dramatic events of the year at the Barn Theatre, Southwick next month. 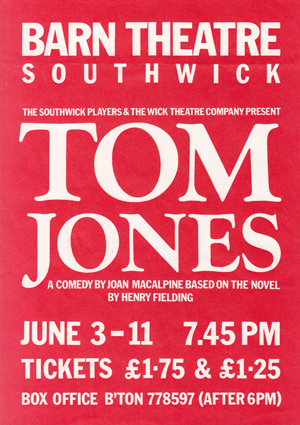 The Southwick Players and Wick Theatre Company are combining forces to stage the colourful comedy, Tom Jones, from June 3 – 11. Adapted by Joan MacAlpine from Fielding’s novel, the play is being directed by Players member Chris Kenneford, who first suggested a joint production. Producer is Wick treasurer Barrie Bowen who has experienced the logistics of accompanying very large cast plays having directed among others, The Boyfriend and Oliver. ‘The close teamwork of director and producer is vital to a project such as this, ‘ he commented. The title rôle of Tom falls to David Stenning, a very different part from his last appearance as the Water Rat in the Players production of Toad of Toad Hall. David studies drama in Brighton and was on the shortlist of two for William in the television series Just William. Alan Upton and Ralph Dawes, respectively Squire Allworthy and Thwackum, are long standing members of Wick. Alan has appeared many times in comedy rôles and Ralph’s connection with Wick stems from its founding days in 1948. Ken Mandel finds himself in the strange situation which can only come about in plays of being the father to his wife. Ken takes the part of Squire Western and his wife Lucy that of Sophie Western. AFTER 35 years of rivalry, two Southwick amateur companies have joined forces for the first time to stage the bawdy Restoration romp Tom Jones. The Southwick Players, who started in 1935, and The Wick Theatre, dating from 1948, opened the play drawn from Henry Fielding’s novel last night. It will run until next Saturday at the Barn Theatre, Southwick Community Centre, nightly at 7.45 p.m. The merger of the two rival companies was described as “generally amicable” by Peter Joyce, secretary of the Wick troupe. “There was still the feeling of two separate camps until some recent rehearsals. Now, our differences have been overcome,” he added. The idea of the fusion was first advanced in February last year by Christopher Kenneford, who is directing the show. The producer is Barrie Bowen, of the Wick company. Christopher recalls that Fielding’s book “was almost universally condemned as highly immoral” when published in 1749. The 1963 screen version starred Albert Finney as the foundling brought up by a squire who pops in and out of many adventures and beds before marrying the Squire’s daughter. The film won four Oscars. Tom in Southwick will be played by David Stenning [pictured above], a drama student in Brighton who was on the very short list of two for William in the TV series Just William. One couple from the Southwick Players will be exploring a new relationship. Ken Mandell is taking the part of Squire Western, while his wife Lucy, will play the Squire’s daughter, Sophia. On Saturday to the Barn Theatre, Southwick, for a combined production by the Southwick Players and the Wick Theatre Company of the rumbustuous Tom Jones. It is not easy to review a production in which all 30 members of the cast did well without writing a sustained hymn of praise which may seem to lack credibility. There was splendid direction by Christopher Kenneford, who kept everything moving at a terrific pace. To mention individuals must be a subjective selection but I particularly liked Hilary Wiltshire as the amoral village girl, Molly Seagrim; who really did not know who the father of her child, Miranda Bowen as the equally amoral Mrs. Fitzpatrick and Neil Shephard as her captain husband roaring around thirsting for the blood of his wife’s lover. There are final performances on Friday and Saturday of this week so do yourselves a favour. WICK THEATRE and Southwick Players should combine their talents more often, if Saturday’s sparkling performance of Tom Jones is anything to go by. The two normally rival companies between them produced one of the most entertaining plays I have seen at the Barn Theatre. Joan McAlphine’s comedy, based on the novel by Henry Fielding of the adventures of young Tom Jones, provided excellent raw material for the actors. Under the direction of Christopher Kenneford it was exploited fully, particularly by David Stenning in the title rôle. He jumped effortlessly from being narrator to character, as the story of Tom’s quest to marry one woman unfolded. It took the high spirited young foundling on a diverse route through willing country wenches, liaison in country inns and even prison. David’s charisma shone through the riotous romps and offered a solid base for the rest of the cast. While there may have been some nerves, there were no discernable weaknesses and no missed lines or cues. Particularly well played was the scene at the Upton Inn. The timing as the characters flitted from one bedroom to another was spot on, despite the restrictive size of the set. There were impressive performances from every member of the cast, but special note must be made of Hilary Wiltshire as Molly; Lucy Mandel as Sophie; Derek Fines as Blifil; Vikki Wood as Mrs. Waters and Mo Joyce as Susan. The backstage helpers contributed greatly to the success of the show, with a well designed and constructed set, authentic costumes and sympathetic lighting. Tom Jones continues its nine night run tonight [Friday] and tomorrow.